The same task of building and retaining followers can be especially tricky if you’re a business, but there are many ways you can utilise Instagram for this purpose. Then, when you’ve got your followers, you need to keep them interested – whilst also putting your business plans into action – to warrant the effort you put into Instagram in the first place. Here’s a few tips and tricks for getting you on your way to Instagram fame and success. Why do you need a successful Instagram in the first place? From the outside, Instagram seems like a place to share holiday snaps, selfies and general photos that don’t have much use. However, recent data has shown that 20% of all internet users also use Instagram. When considering this in terms of actual people, Instagram have said that more than 300 million people use the app or site on a daily basis. That is a huge section of social media marketing waiting to be tapped by businesses. Dynamic ads: where businesses can upload an entire catalogue and Instagram will pick the most relevant link for each particular user. Insights on Instagram: which analyses posts and gives businesses real-time data responses to their content. In-app ad promotion: so once you’ve seen which post is working the best on insight, it’s never been easier to turn that post into a targeted advert. With the growth in business features within Instagram, they’re making it clear: this is a platform for work and play. So, how can you build a profile that’ll get your business noticed? Let’s take a look. 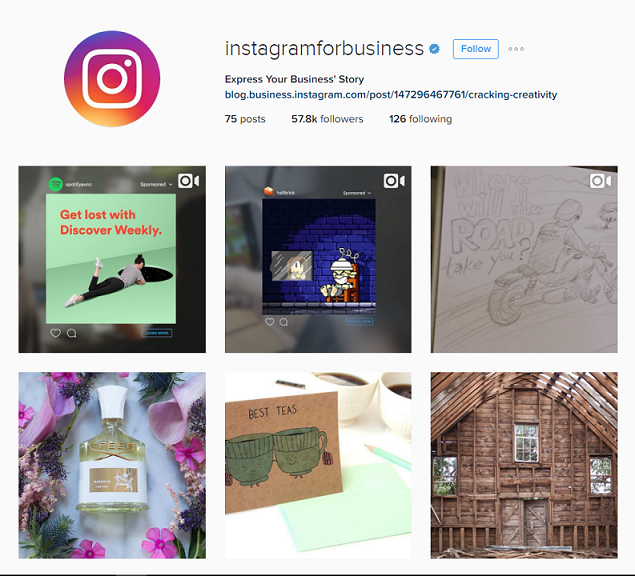 Engaging existing audiences is a key part of growing any business and Instagram is an excellent tool for this. Much like Facebook and Twitter – which are already widely used by businesses – Instagram is heavily based around tagging and interaction. By posting content that users can interact with (like being able to tag their friends), it makes the customer feel involved and simultaneously shares your content to more people. Joe Wicks (AKA The Body Coach) ends pretty much all his healthy food tutorials with either “tag a friend who might like these” or “are these a bit of you?”. Both of these encourage engagement and help build a casual relationship with the business that earns followers. Joe Wicks should know; he has 1,304,232 followers on Instagram alone. Also, by following back users that have engaged with the content you’ve shared, you make potential customers more receptive to your brand. 97.2% of all engagement on Instagram is through likes. This is a quick and easy way to gauge audience responsiveness and for businesses to engage with their users. Working with other companies or Instagram personalities – such as YouTube stars or bloggers – is a great way to gain brand awareness, either through paid or unpaid shout outs. Now, it may not be feasible to get the Kardashians to endorse your business or brand, but using vloggers or bloggers with an existing social media presence is a beneficial way to gain exposure too. Your content department can definitely get in on this. Back-linking your content – such as blogs – to similar accounts could lead to wider exposure. The delicious looking burger above is an excellent example of this. The letscookvegan account curates and shares tasty recipes from across the blogosphere and now has 312,964 followers. The original creator of the recipe, werealljustpineapples, only has 1,310 followers. This makes it a perfect way of attracting new followers and gaining more traffic. Collaborative competitions that run exclusively on Instagram can serve as an invaluable incentive for users to continue following your account. Many Instagram competitions run in conjunction with other businesses or personalities, such as vlogger-endorsed giveaways. Unlike Facebook, who have recently implemented measures to prevent these sort of competitions, Instagram contests for followers – or “like-gating” – is perfectly acceptable. A condition of these competitions is often to either tag a friend in the post, therefore sharing your brand to a wider audience, or to follow both collaborators until the competition winner is announced. In the latter case, many users often choose not to unfollow these accounts and therefore can be further engaged by the content you post. On average, brands tend to post 2.43 times a day, the majority of these posts being images rather than videos. When you consider the timeline layout of Instagram it can be tempting to post more rather than less, especially when users miss around 70% of their feed. This may sound like a bad thing, but this is only because Instagram has grown into a social media giant. However, posting too much could be irritating to users who follow a variety of account types and come across a bit like spam. By posting thoughtful and engaging content, that has wide appeal, twice a day, rather than trying to spam your users feed, you’re able to engage more successfully with your audience. If you respond to comments and acknowledge new followers, you may find that customer retention will be higher than if you constantly post with engagement. Clothing store, Forever 21, is very active on Instagram. A quick look on their account and you can see that they put up a post every 4 hours. Now, this may seem excessive – how are you supposed to come up with that much original, engaging content every day? Look at the account again: it varies between fun videos of the in-office staff, artsy, inspiration pictures and, of course, plenty of product images. If you want to have an active feed, make sure you vary the content style – no one wants to see twenty consecutive posts that are straight out of your catalogue. Perhaps the hardest part of creating a successful Instagram account is deciding what to post and what not to post, especially for a wider audience. Where you might appreciate a picture of a sunset you took on holiday three months ago, chances are it won’t appeal to the masses. Businesses need to strike a good balance between branded posts that promote new products and offers and entertaining, easy-going posts. This is especially important when considering the previous section about over-posting. Part of having a successful brand is creating a personality, particularly on social media. 90% of all Instagram users are under 35. The younger market want to be entertained. They don’t want to go onto Instagram and be bombarded with ads. At the end of the day, success on Instagram is all about engagement. The average time a user spends on Instagram in one session is 21 minutes. This means that easy-to-spot, well-tagged content is king. Without engaging content that draws in users and persuades them to share it, your Instagram probably won’t succeed. Much as with any facet of business, customer retention is imperative. Instagram is a growing social media platform that keeps its users coming back. With the right social media strategy, the user retention that comes from Instagram could easily be transformed into customer retention for your business. By collaborating on content, posting thoughtfully and knowing your audience, you’ll see your Instagram following grow. And, with over 500 million users worldwide, it’s well worth the investment. Rebecca Marie Crowe is a content marketer at FM Outsource and enjoys social media, travelling and eating too much.